We’re going to be honest here, when we think of Nevada, we usually think of Las Vegas. From a visitor perspective, Las Vegas takes on such a huge mindshare of our pre-conception of the state that it nearly eclipses everything else. It wasn’t until last year’s Bicycle Tourism Conference, where we chatted with folks from Travel Nevada and NDOT, that we learned about the wealth of outdoor recreation possibilities. 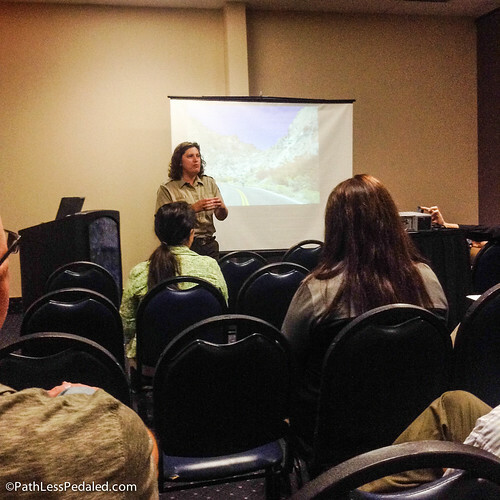 We recently had the opportunity to do a breakfast keynote at the Nevada Bicycle and Pedestrian Summit, and we met with bicycle advocates, tour operators and State Parks to learn about the bicycle tourism opportunities in Nevada. We arrived unsure of what to expect, but left thrilled about the possibilities. Nevada, much like Oregon (perhaps even to a greater extent), has very small, rural and isolated communities, many of which are seeing some tough times. What they lack in built attractions like golf courses, amusement parks and shopping districts, they make up in natural beauty and being nestled in a landscape of mind-blowing scale. 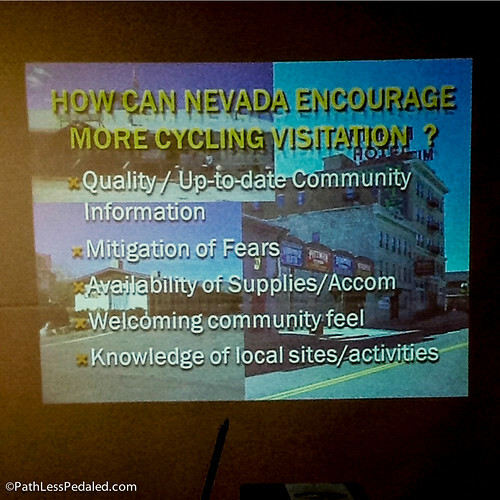 We sat in on a presentation led by Bill Story of NDOT about bicycling economics, and it was heartening to see that they see bicycle tourism as a means to attract people to these areas of the state. Even better, is that they are fairly realistic about the challenges of promoting tourism in those remote areas. Another surprise is how active State Parks is with bicycling. 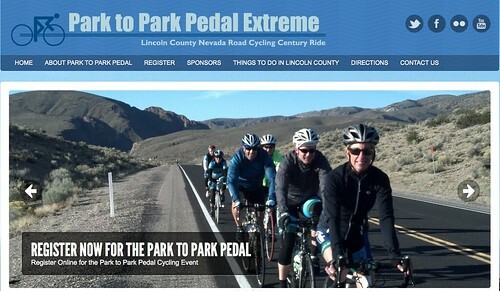 Dawn Andone, a park ranger in Lincoln County, Nevada helps run a yearly bicycling event called Park to Park Pedal Extreme, with the help of local Lincoln County residents as well as a Las Vegas-based bicycling website – BikingLasVegas.com. It first began as a way to increase visitation to the region’s State Parks. It is unique in that it ends in a big gourmet Dutch Oven cook-off, a Lincoln County specialty. Dawn Andone from Nevada State Parks talking about the two rural bicycling events she helps organize with local communities. In speaking with Dawn, we learned that the local residents were absolutely crucial in pulling off the ride. During their first year, many stood on the sidelines curious about the strange event. A few years later, they were clamoring for another event to bring in more visitors. To that end, Dawn also organizes a gravel event, called the Beaver Dam Gravel Grinder which ends in a BBQ! Our kind of ride! A successful Nevada State Park’s hosted ride that ends with a Dutch Oven meal! Want a gravel ride that ends with BBQ, this is for you. 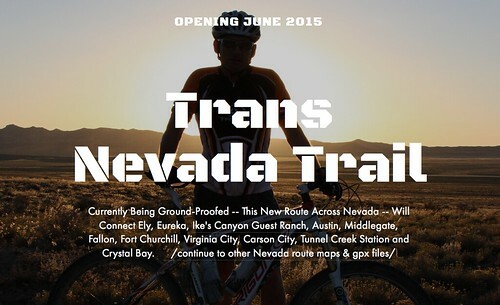 Look for a gravel trans-Nevada route in the future! Speaking of gravel, we also sat in on a panel with Travel Nevada’s Greg Fine, where he unveiled some early plans for a bicycle gravel network throughout the state. If there is anything that Nevada has a lot of, it is gravel and non-paved roads. After the session, there was a lot of spirited discussion about what they should do next. It was really exciting to see the sparks fly as Nevada bicycle advocates, State Park employees and tourism professionals were in the same room talking with each other for the first time! 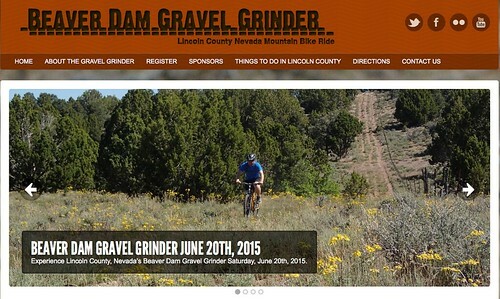 In our research before visiting the state, we also learned about TransNevadaTrail.com, a group of cyclists that are currently ground-truthing a gravel route across the state. While our visit to Nevada was short (we didn’t even get to ride! ), it left us intrigued. As a state for bicycling, it offers a blank canvas. With the current trend in adventures by bike and bikepacking, it could be poised to be the next hot bicycling destination! Absolutely loved your presentation, particularly the way you make responsible travel a foundation of your work. Better places to live are better places to visit!